Here is the great rupture. 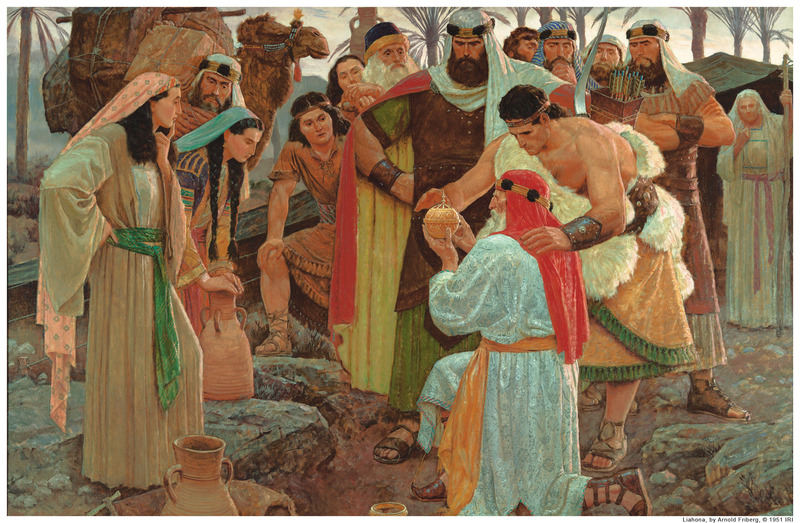 Nephi acknowledges that it came in a dream—a dream that made a coherent narrative of the details of Lehi’s life. Did he feel like a failed prophet? Did his heart break? Or did he feel vindicated or at least consoled in joining that host of ancient prophets who were rejected by their people—or was that a later, literary reconciliation? Regardless, the dream tells him to leave the Land of Promise. Again, forsaking the idea that this was a dramatic overnight event, and recognizing instead that it likely took place over the course of some time—what were the conversations with Sariah (goodness, I hope he had them) and his children? Neighbors or friends? Or if not with others, what were the conversations with himself? Jeremiah (whom Nephi later extolls) had not been commanded to leave, but to stay and preach and get himself locked up in prison. Other prophets had been killed. Why was Lehi spared? Was it a sparing? Why was he commanded to leave? Also worth noting, at this point their journey is conspicuously lacking a destination or end goal. We’re so familiar with Lehi’s divinely led exodus and how it ends that it’s easy to overlook how odd and directionless this commandment is at this point in their journey. Surely Lehi felt some puzzlement and even regret (or pangs) at leaving. For as Nephi next offers us in a candid if understated way, Lehi was really being asked to leave everything. Except his family. Take Sariah and Laman, Lemuel, Sam [a variation of Shem maybe? Or was there a Hebraic diminuitive for Samuel that makes no sense in English so Joseph saw it as Sam?] and Nephi and depart. Back into the wilderness. Forsaking his inheritance, abandoning the deeply ingrained cultural narratives and understandings of the way that time and space and theological politics and peoplehood all hung together in that spot. Abandoning—reversing—Moses and Joshua. And undoubtedly leaving his own heart. Remember thar if we back up just a short way in the text, Lehi’s reaction to the wickedness of his people is the same as that of his grandson later in the text: he prayers for them with all his heart. Despite his being a refugee in Jerusalem—or maybe because of it, because he knew how very real the threat of destruction and homelessness was—he prayed with intensity on behalf of his people. God’s response was first to call Lehi to actions that would alienate him from his people; and then, when that alienation reached a point of crisis, to call Lehi to abandon his people. To abandon everything. Nephi says little. Really, he couldn’t be more sparse. But he says enough that we can see how distorted Laman’s & Lemuel’s grievances were, failing to take into account as they did Lehi’s own deep loss. And herein is also, perhaps, a more general phenomenon, one that I think we see today—although sadly, I think that many forget that it is a deeply religious phenomenon as well. How ought one to act, what makes sense, on the basis of what do we act when we’re called by God to abandon God? This seems to me the substance of the Abrahamic trial. There is no talk of a future promised land at this point, no brass plates with Zenos’s talk of a branch of Israel being transplanted. All we have is God commanding Lehi to abandon his entire life’s experience of God. It is always only a terrifying thought. Likewise, such singular, terrifying commandments create new possibilities, transform our understanding of and relationship to God. And so this segment ends, not with Lehi lost in nihilistic despair or ennui. Rather, he’s gathered with his family, who have now taken on a radical new significance. Abandoning Jerusalem, he abandons their cultic prohibitions as well, building an altar, reestablishing a “tabernacle” in the wilderness, maintaining the covenant in a new way. And in response to all the shock and terror and heart wrenching experience he has just accomplished, he gives thanks. I think this may be a key to the difference between Latter-day Saints in and out of traditionally LDS-colonized areas. Utah Mormons consider themselves to be in a Land of Promise, and generally don’t leave, as many with family that went away to BYU and married Utahns experience. Frontier Mormons consider the Land of Promise to be their homes, to which a surprising proportion consider themselves called – I would love to see poll numbers for the number of LDS families outside of the Corridor that report divine inspiration as a primary reason for their place of residence. Utah Mormons may think of themselves as children of Israel, brought to their suspiciously Israel-like homeland by the power of God. Frontier Mormons, in my experience, think of themselves as compatriots of Lehi, especially as so many of these promised lands are abandoned by the same inspiration that created them. And to these frontier folk there is no stranger land to be guided to than Utah. nl: reminds me a bit of the difference between Nephi’s and Jacob’s view of the Land of Nephi. Personally, I feel like I’ve experienced both approaches to Utah/Frontier that you describe. The question of why Lehi left but not Jeremiah is a good one. The text doesn’t really offer any suggestions. Makes one wonder if the stories of the lost 10 tribes bear some resemblance to Nephi/Lehi.